Superior quality craftsmanship is seen in this gorgeous candleholder. Crystal clear glass molded into a striking ribbed pattern form the hollow base, culminating at a center bullet point. 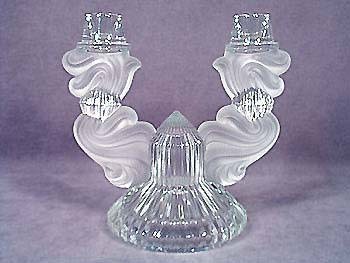 Frosted glass formed into a lovely flowing pattern forms a candleholder on each side. There are two small flaws in the frosted glass. The thick glass on the bottom is ground for a smooth flat surface. Standing 7-5/8" tall, this elegant piece is 8" wide and weighs well over 2-1/2 pounds.